Union County Clerk Joanne Rajoppi speaks with a commuter at the Union train station about updates for “Union County Votes,” a mobile app that provides voters and election watchers with on-the-go information. One update is a new button labeled “Presidential Candidates.” It provides direct links to the official campaign website of each candidate that have been certified by the New Jersey Department of State. The existing “Where do I vote?” button has also been updated to reflect any new changes in polling places. The “Are you 17?” button on the Union County Votes app provides information for eligible Union County residents who are currently age 17 but who can register in advance, if they turn 18 on or before November 8. 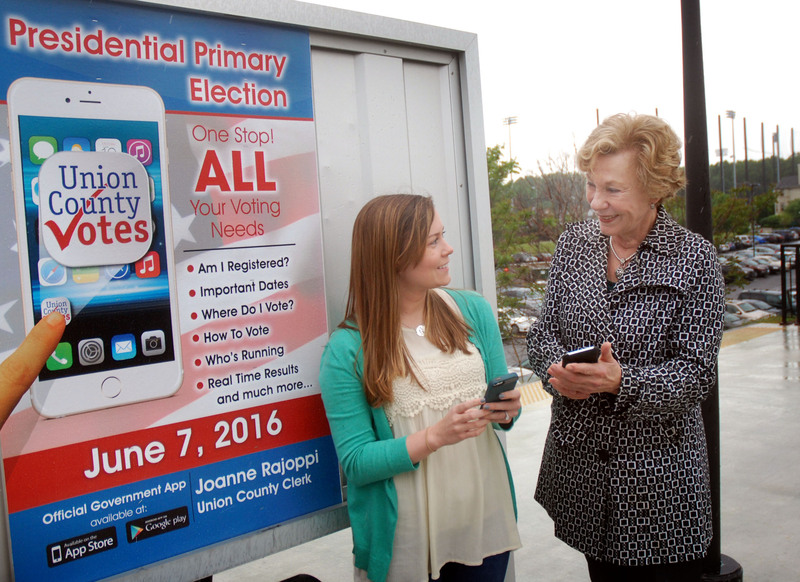 Ms. Rajoppi created Union County Votes in 2014, to help connect the public with critical information about voting and elections. The free app enables voters to find their polling place, request voter registration forms and vote-by-mail ballots, view sample ballots, and follow unofficial election results in real time. The app also provides information for persons interested in becoming a poll worker or running for office, including election filing dates and district maps. For all election information, including complete details and deadlines for registration and Vote-By-Mail, visit the County Clerk online at ucnj.org/county-clerk or call the Election Division at 908-527-4996.